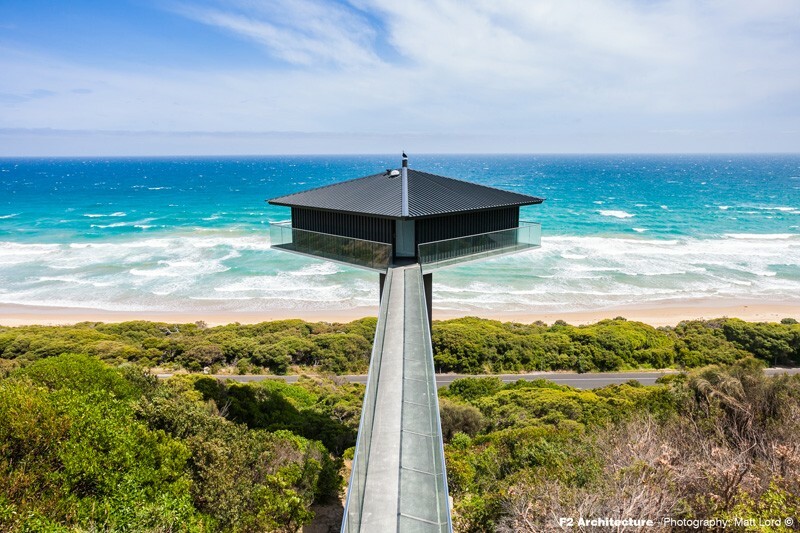 Perched high above the Southern Ocean on Australia’s famous Great Ocean Road, the Pole House by F2 Architecture is a great example of the power of architecture, made possible by the spectacular location combined with the unique experience that a work of architecture can bring to such a unique expanse of coastline. 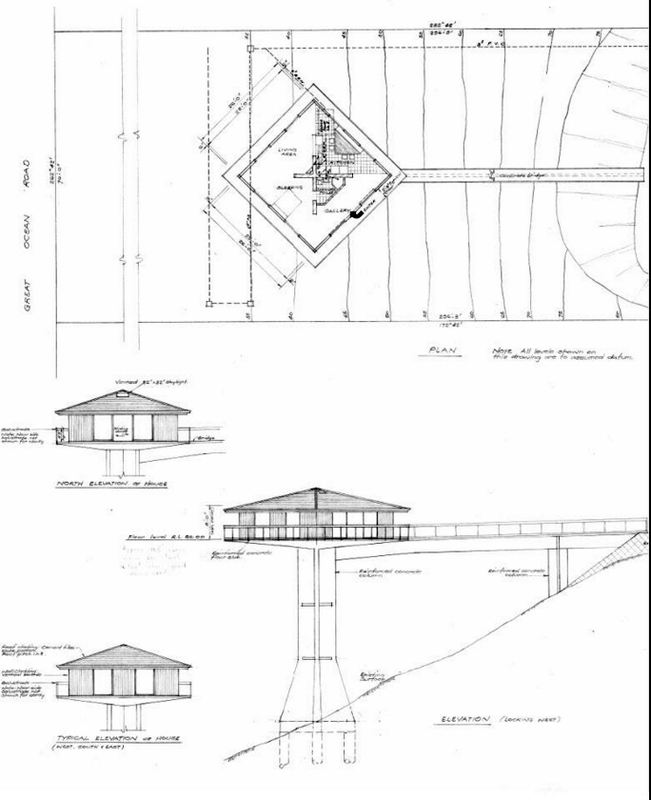 The house sits atop a concrete platform supported by a 13m high pylon built into the steep hillside. Accessible only by a narrow concrete bridge, the visitor is delivered to an entrance which is recessed into the metal clad walls that face the hillside. As soon as you step on to the bridge you know you are in for something special. Once inside, a curved timber clad wall directs the visitor to the living area with its spectacular 180 degree view of the Southern Ocean. Full height glass walls can be slid back to open the living area to the panoramic ocean view, sun and sea breeze. Frameless glass balustrades at the perimeter of the elevated platform provide safety and wind protection without obstructing the view. A fireplace is suspended from the ceiling in the corner of the living area to provide warmth and ambience on cold winter days or in the evening. n contrast to the scale of the landscape, the house is very modest in proportion, the ideal weekender. More akin to a luxurious suite than family accommodation it contains a spacious living and dining area, bedroom and bathroom in an open plan arrangement. The kitchen, bed, robe and storage are built into the flanking walls to maximise the sense of space and provide flexibility. The bathroom is concealed in a timber clad drum which is centrally located to provide separation between the bedroom and living areas. The drum is not full height to allow the pyramidal roof form to float above the living areas. The deceptively simple square plan of this house underpins the dramatic experience it delivers. The two walls facing the hillside are solid providing complete privacy and a sense of detachment from the land, the only connection being the narrow entry bridge. The two walls facing the ocean are glass. 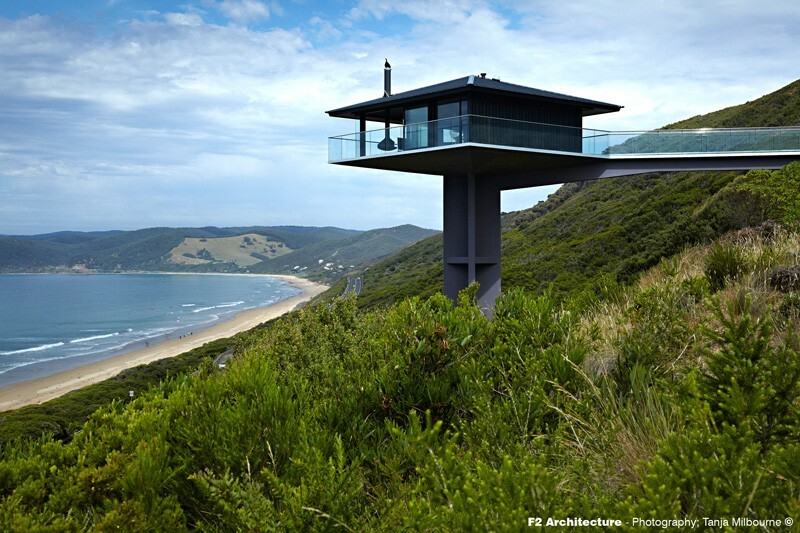 The result is a living area perched high above the landscape, referencing only the vastness of the ocean, the horizon and the distant land forms.